So, with this helpful map we can see what the Green Blob is made up of and how it fits with Paterson’s description. Most of it seems to be based in the US; the UK wing is over on the right of the diagram. There are the environmental pressure groups: Greenpeace, Sierra Club, Rainforest Alliance. Closely related to these are the climate propaganda websites: Climate Reality, Climate Home, Desmogblog, Climate Central, and of course Carbon Brief itself. Only a few climate scientists are there: Michael Mann, Peter Gleick, Katharine Hayhoe, Marshall Shepherd. The text of the article at Carbon Brief is amusing, as it nicely illustrates the complete lack of self-awareness that is a distinctive characteristic of the Green Blob. Different communities or “tribes” are coloured differently, given labels (for example one is “UN” and one is “Canada”) and discussed in the article. But the joke is that the most prominent group and feature of the whole map, the Green Blob itself, is not mentioned or labelled as a tribe! Climate sceptic groups are identified, and falsely described as being an “echo chamber” who “rarely retweet or converse with people outside of their tribe”. 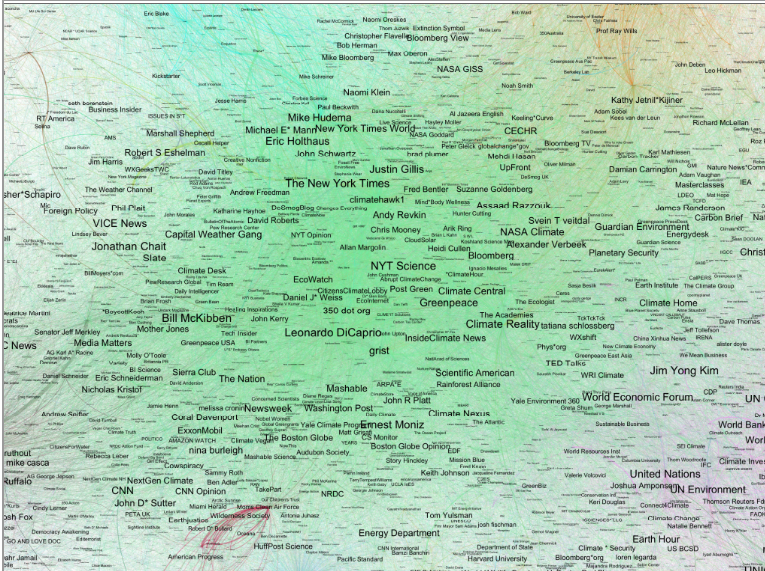 This is completely untrue, as can be seen by looking at the tweets of Tom Nelson or Steve Goddard, two of the most prominent sceptic tweeters identified on the map. The real echo chamber is of course the Green Blob itself, which talks to itself and either refuses to debate with or blocks dissenting voices. Tags: comment, green blob, propaganda. Bookmark the permalink. How does the National Academy of Sciences use review of annual budgets of major federal research agencies for Congress to direct the flow of federal funds to finance the Green Blob, and yet avoid criticism by climate sceptics? Nice post! I always think it interesting to find how little influence many climate scientists have in their own arena (e.g., Twitter). There’s more evidence of who’s in the echo chamber refusing to talk to anyone outside their tribe in the latest email release related to the RICO20 fiasco. Edward Sarachik: “At this point I decided it is folly to respond to any of these people”. Kevin Trenberth: “Yes the best thing for all is to ignore these people”. Eugenia Kalnay: “I agree the best thing is to ignore them”. Also, Shukla ignored questions from Fox journalist Maxim Lott. Actually Twitter for warmists and the RICO letter fiasco have a lot in common. Neither allow a full and frank exchange of ideas and in consequence gives the user a false sense of success until it all comes back to bite them in the bum. The Twitter map produced by Carbon Brief is the stupidest graphic illustrating global warming catastrophe since the last stupid graphic illustrating global warming catastrophe. When will these idiots understand what I was taught in the first week of A-level statistics fifty years ago – that a graphic may illustrate a fact, but it is not a fact in itself? This word-soup illustrates sod all save the stupidity of its inventors. You’d have to be insane to search it for enlightenment on the nature of the climate debate. They know that. We know that. Why do they do it? They’re not talking to us. They’re talking to their readers (if any) who are presumably true believers. Why do they treat their faithful followers (if any) with such contempt? Geoff, you could give us a link. I have been over to the duncies site – Jules and James – and I have no idea what you might be engaging with. There is a post about the struggles of these 2 massively intelligent people to come to terms with quantum brick laying. Pictures of cats. Am I missing something. I then went to ATTP but couldn’t see anything relevant amidst the general self – pity. Sorry Geoff, I tracked down the reference to a really odd paper. It was mathematical without any regard to the physical consequences of rainfall being predicted as it was. Every time Annan shows his face in public, this paper should be referenced. Does he still hold by it? I was bamboozled by Miab’s comments until I realised they belong on the ‘unbearable politeness’ thread. Perhaps you could post them there, then I’ll delete them from here?